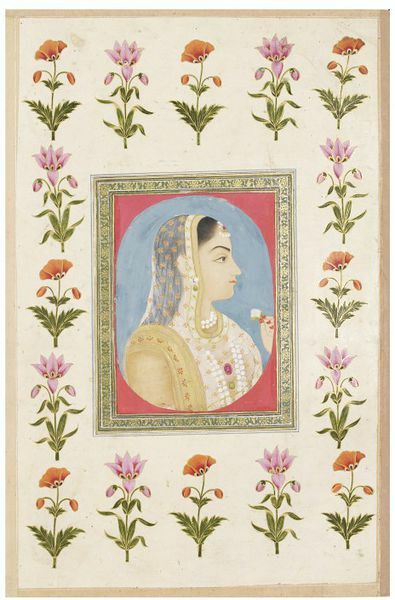 Painting in opaque watercolour on paper, a head and shoulders profile of a lady looking to the right and holding a white flower bud. She is shown against a blue oval background surrounded by a plain crimson frame. She wears a transparent odhani over her head and shoulders. It has a polka-dot pattern of stylised red quatrefoils with golden borders. She wears pearls with a red gem on her forehead, a pearl earring with a green gemstone drop and a matching green drop under a faceted crimson gem attached to her clothes on her chest. She also has two rows of pearls at her throat and two longer rows falling down below. Her nails and finger tips are coloured red. There is little modelling to the face. 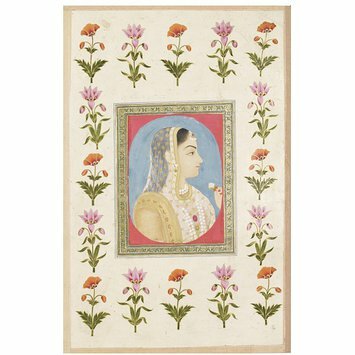 The painting is framed in green paper strips decorated with a gold design of stylised lotus buds set within white, gold and black outlines. 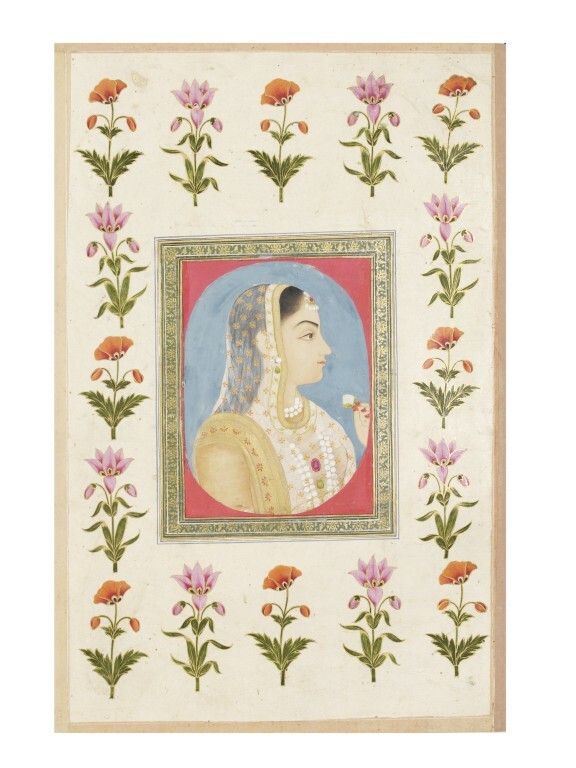 The border design of red poppies and pink lilies with gold outlines and detailing are set on an ivory-coloured ground. The page has buff-coloured strips of paper with a white line along the inner edge along its margins, and a further beige-coloured strip of paper stuck along the right hand edge as a gutter for the binding of the album.